Disney Comics Randomness: Oswald the Lucky Rabbit in "Just Like Magic"
Oswald the Lucky Rabbit in "Just Like Magic"
Walt Disney's Comics and Stories #726 had something very special. 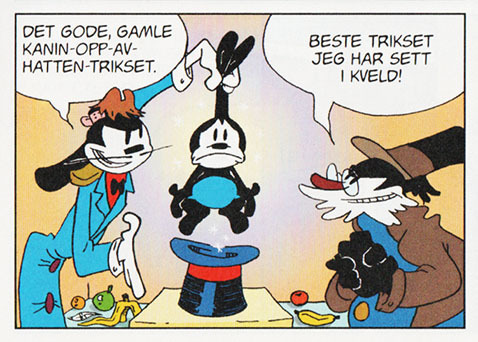 For the first time in its 75 year history the comic features Oswald the Lucky Rabbit! Not just on the cover by Amy Mebberson, but also in a story written by David Gerstein and drawn by animator Mark Kausler. 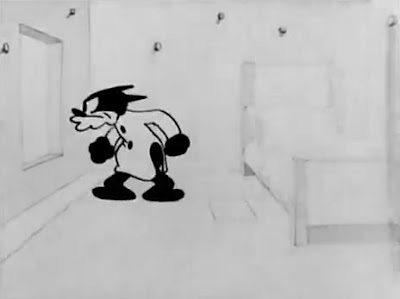 The character was created for a series of short cartoons produced by Walt Disney Studios in 1927 and 1928, but the rights belonged to Universal pictures. When Disney stopped creating Oswald cartoons others continued and the character went through several redesigns over the years. 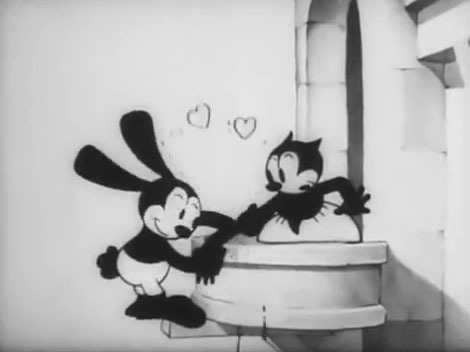 In 2006 as part of a trade Disney finally got the rights to the Oswald character as well as the rights to the old cartoons produced by Walt Disney Studios. Well, that’s the short story. 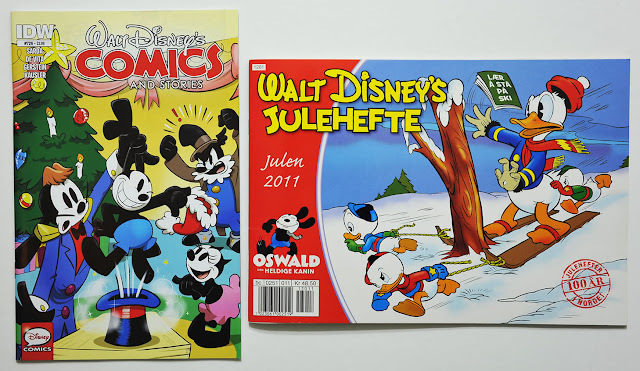 So in Disney’s entire comic book history, up to 2006 they never had the rights to the character they once created and no Oswald comics under the Disney logo were created. After 2006 we’ve seen a few stories based on the Epic Mickey video game, but "Just Like Magic" is the first (and so far only) comic story created in Oswald’s old animation style. The story didn’t get printed in English until this Christmas, but it’s actually 5 years since its first printing. The story was created for a Norwegian Christmas comic in 2011, where David also has been the editor since the start of the series in 2001. Cover of IDW's WDCS #726 and the Norwegian "Walt Disney's Julehefte 2011"
To get the panel a bit wider with less white space on the sides the panel has been slightly enlarged and the bottom trimmed a bit compared to the Norwegian print. But that’s the only alteration of the art I could spot comparing the two prints. Panel from "Walt Disney's Julehefte 2011"
As I said earlier "Just Like Magic" is drawn in the same style as the old cartoons. When I first saw this story in 2011 I thought it was a bit strange looking, but that’s probably because this was right in the middle of the popularity of the Epic Mickey game, and I had gotten used to the new modern design. I didn’t think the same when re-reading it in English, I actually like the style! 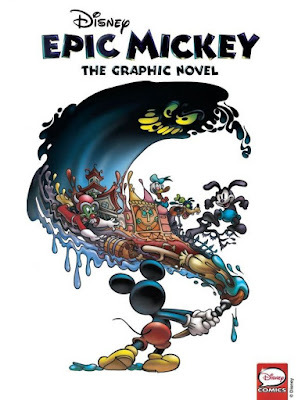 If I remember correctly I had also just read the comic adaptation of Epic Mickey when getting the Christmas comic, so I had that to compare to. It was only available digitally (still not printed in English I think) and I had to borrow someone’s Apple device to get to buy it through iTunes… Now you can get it more easily on comiXology, and it’s also printed in some countries. Cover for the digialt edition of "Epic Mickey - The Graphic Novel"
As you can see, Oswald and Ortensia had a more modern design in the graphic novel. Here’s a screencap from "Oh What a Knight", where the characters looks more similar to the ones in "Just Like Magic". 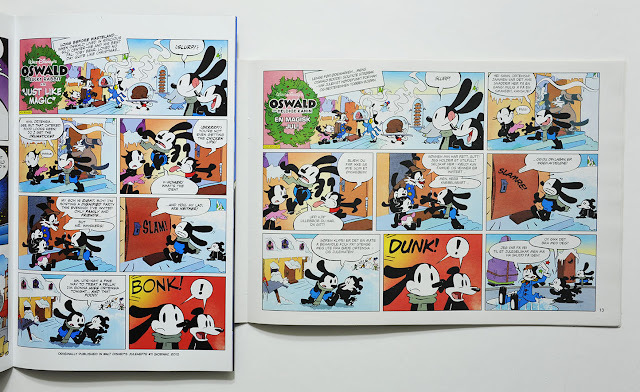 If you missed out on WDCS #726, you can also find "Just Like Magic" in the trade paperback with the unusual long title "Donald and Mickey The Walt Disney’s Comics and Stories 75th Anniversary Collection" (puh..). The trade paperback has a gallery of covers at the end too, but for some reason the Oswald one is not included. I'll have to find this issue, I'm actually pretty curious about this story. Hadn't noticed they tie it with Epic Mickey, having the "Wasteland" mention. 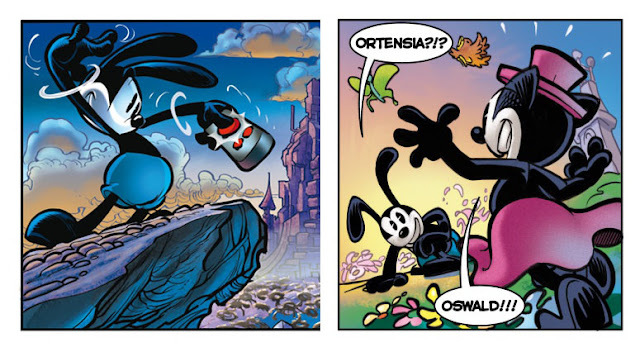 Saddens me a bit, I'd love to see Oswald start to be folded into the larger Disney Comics world. "But a later 4-tier printing was probably thought of when creating the story": yes it was! Though at the time, I was only thinking of Egmont's later reusing the story in the standard Egmont weekly—I wasn't considering American publication. Glad you spotted Mr. Whiskers in RIVAL ROMEOS. Our costume for him in "Just Like Magic" came from artwork for the lost cartoon THE BANKER'S DAUGHTER—and we've since found that he also wears it in MISSISSIPPI MUD, a post-Disney Oswald cartoon. The "Wasteland" mention was added at Disney's request in 2011. I'd have rather left it out, but they wanted the story put in some kind of continuity with the then-current games. Thus when you wrote the story, were you conceiving it as a pre-Wasteland or a post-Wasteland story ? thanks for writing this fun comic about my favourite dysney character oswald the lucky rabbit. sorry for this question but is there any indication in which oswald the lucky rabbit has a big ego in the 1927-1928 shorts? I’m a bit surprised the story is not used in any other Egmont comics yet. Maybe it will now that editors see it can be printed in the regular format too. - Ortensia’s original name was Sadie, but a new name was created for the Epic Mickey game (according to Disney wikia). But this required fact checking and research that I kept postponing, so I just went with what I had. The KKM: Thanks for linking the blog! I should do some design work on this blog too, adding links, a real header and stuff. I'm not exactly sure about Toby's debut—but with the design Mark used for him, going by surviving films and production materials, he is in THE OL' SWIMMIN' HOLE and (briefly) SLEIGH BELLS. His design is identical to the two bears in TALL TIMBER, whom we also used as design references. He was later in Lantz's KENTUCKY BELLES (and others? not sure!) before becoming Oswald's pal in the comics. Homer's first appearance is in ALL WET—he's also in EMPTY SOCKS and THE FOX CHASE, and (briefly) SLEIGH BELLS. Non-Disney appearances include HOMELESS HOMER, SAUCY SAUSAGES, and THE FIREMAN among others. J. P. Whiskers was indeed named for this story. Thanks a lot for this info! It’s not that easy trying to identify characters in the early Oswald cartoons. I tried looking for Toby in a few, but they are all so alike, sometimes it’s hard to even see if it’s a bear, cat or a mouse... There is a bear-like character on the train in "Trolley Troubles" too, but he is probably just a random one. So—since the character at least existed, in some form, in the earliest days, it was easy and expedient to drop him into the same role for my comic.